My son and I just picked over 100 delicious cherry tomatoes from our backyard! Besides just popping them in our mouths, which we did plenty of, I decided to incorporate them into a baked pasta dish. This recipe was adapted from 365 Days of Pure Vegetarian. To enhance the flavor of the simple pasta sauce, I added more cherry tomatoes and nutmeg. The resulting baked dish was delicious and very easy to make. It tasted very fresh, and really highlighted all of the sweet tasty home-grown cherry tomatoes! For a gluten-free version, use any brand of gluten-free pasta. For the recipe, head on over to 365 Days of Pure Vegetarian – Baked Pasta w/Cherry Tomatoes (gluten-free option, contains dairy). 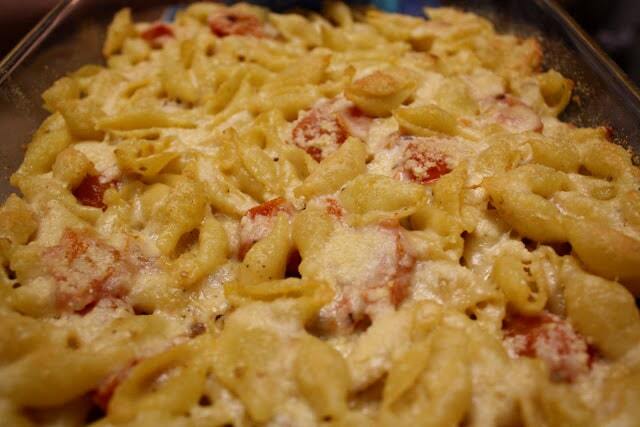 The only changes I made to the recipe was to add 15 cherry tomatoes, 1/2 teasp ground nutmeg, and shell pasta shapes. I really liked this recipe and had been looking for ways to use cherry tomatoes! Exactly the same reason I made it the first time around...I had a whole bag of home-grown cherry tomatoes!